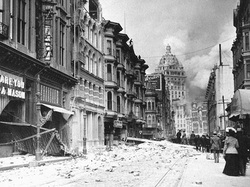 How did the San Francisco Earthquake Happen?! How did this massive earthquake really happen. This earthquake happened because of the faults and plate tectonics. 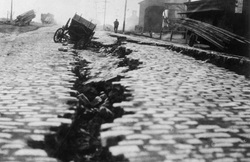 The San Andreas Faults caused the earthquake in San Francisco. It caused the earthquake in San Francisco because it started over there and came to San Francisco. destroyed San Francisco and it was so strong that they felt it in Southern Oregon and South Los Angelos. The tectonic plates also moved and that caused the earthquake. When the tectonic plates move the move apart or move together and that's what causes it. That is what caused the 1906 San Francisco earthquake.